Giulio Andreotti OMI SMOM OCSG OESSH (Italian: [ˈdʒuːljo andreˈɔtti]; 14 January 1919 – 6 May 2013) was an Italian politician and statesman who served as the 41st Prime Minister of Italy (1972–1973, 1976–79 and 1989–92) and leader of the Christian Democracy party; he was the sixth longest-serving Prime Minister since the Italian Unification and the second longest-serving post-war Prime Minister, after Silvio Berlusconi. Andreotti is widely considered the most powerful and prominent politician of the so-called First Republic. Beginning as a protégé of Alcide De Gasperi, Andreotti achieved cabinet rank at a young age and occupied all the major offices of state over the course of a forty-year political career, being seen as a reassuring figure by the civil service, business community, and Vatican. In foreign policy, he guided Italy's European Union integration, and established closer relations with the Arab world. Admirers of Andreotti saw him as having mediated political and social contradictions, enabling the transformation of a substantially rural country into the fifth-biggest economy in the world. Critics said he had done nothing against a system of patronage that had led to pervasive corruption. Andreotti staunchly supported the Vatican and a capitalist structure while opposing the Italian Communist Party. Following the popular Italian sentiment fo the time, Andreotti also supported the development of a strong European community paying host to neo-liberal economics. Though Andreotti belonged to the right-wing correnti, he was not adverse to the implementation of the European Social Fund and Regional Fund in building the European economy. At the height of his prestige as a statesman, Andreotti was subjected to damaging criminal prosecutions. Charged with colluding with Cosa Nostra, courts couldn't prove that he had maintained his links with them after 1980, and ruled the case out of time. The most sensational allegation came from prosecutors in Perugia, who charged him with ordering the murder of a journalist. He was found guilty at a trial, which led to complaints that the justice system had "gone mad". After being acquitted of all charges (actually, in part due to statute-barred limitations), Andreotti remarked, "Apart from the Punic Wars, for which I was too young, I have been blamed for everything that's happened in Italy." Andreotti served in numerous ministerial positions, including as Minister of the Interior (1954 and 1978), Minister of Finance (1955–58), Minister of Treasury (1958–59), Minister of Defence (1959–66 and 1974), Minister of Planning and the Budget (1974–76) and Minister of Foreign Affairs (1983–89) and was a Senator for life from 1991 until his death in 2013. He was also a journalist and author. Andreotti was sometimes called Divo Giulio (from Latin Divus Iulius, "Divine Julius", an epithet of Julius Caesar after his posthumous deification). 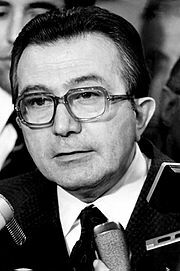 Giulio Andreotti, the youngest of three children, was born on 14 January 1919 in Rome. His father was a primary school teacher from Segni, a small town in Lazio, who died when Giulio was two; after a few years his sister Elena also died. Andreotti attended the Liceo Torquato Tasso in Rome and graduated in Law at the University of Rome, with the vote of 110/110. He showed some ferocity as a youth, once stubbing out a lit taper in the eye of another altar boy who was ridiculing him. His mother was described as not very affectionate, and an aunt is said to have advised him to remember that few things in life are important, and never to over-dramatise difficulties. As an adult he was described as having a somewhat unusual demeanor for an Italian politician, being mild-mannered and unassuming. Andreotti did not use his influence to advance his children to prominence, despite being widely considered the most powerful person in the country for decades. "See all, tolerate much, and correct one thing at a time," was a quote that emphasised what has been called his 'art of the possible' view of politics. Andreotti did not shine at his school and started work in a tax office while studying law at the University of Rome. In this period he became a member of the Italian Catholic Federation of University Students (FUCI), the only non-fascist youth organization which was allowed by the regime of Benito Mussolini. Its members included many of the future leaders of the Italian Christian Democracy. In 1938 while researching the papal navy in the Vatican library, he met Alcide De Gasperi, who had been given sanctuary by the Pope. De Gasperi asked Andreotti if he had nothing better to do with his time, inspiring him to become politically active. Speaking of De Gasperi, Andreotti said, "He taught us to search for compromise, to mediate." In July 1939, while Aldo Moro was president of FUCI, Andreotti became director of its magazine Azione Fucina. In 1942, when Moro was enrolled in the Italian Army, Andreotti succeeded him as president of FUCI, a position he held until 1944. During his early years Andreotti suffered violent migraines that forced him to sporadically make use of psychoactive drugs and opiates. During World War II, Andreotti wrote for the Rivista del Lavoro, a fascist propaganda publication, but was also a member of the then-clandestine newspaper Il Popolo. In July 1943, Andreotti contributed, along with Mario Ferrari Aggradi, Paolo Emilio Taviani, Guido Gonella, Giuseppe Capograssi, Ferruccio Pergolesi, Vittore Branca, Giorgio La Pira, Giuseppe Medici and Moro, to the creation of the Code of Camaldoli, a document planning of economic policy drawn up by members of the Italian Catholic forces. The Code served as inspiration and guideline for economic policy of the future Christian Democrats. In 1944 he became a member of the National Council of the newborn Christian Democracy party, and after the end of the conflict he became responsible for the youth organization of the party. In 1946, Andreotti was elected to the Constituent Assembly, the provisional parliament which had the task of writing the new Italian constitution. His election was supported by Alcide De Gasperi, founder of the modern DC, of whom Andreotti became a close assistant and advisor; the two politicians became close friends despite their very different characters. However, De Gasperi later described Andreotti as a man "so capable in everything that he could become capable of anything". In 1948, he was elected to the newly formed Chamber of Deputies to represent the constituency of Rome–Viterbo–Latina–Frosinone, which remained his stronghold until the 1990s. Andreotti began his government career in 1947, when he became Secretary of the Council of Ministers in the cabinet of his patron De Gasperi. The appointment was also supported by Giovanni Battista Montini, who later would become Pope Paul VI. During the office, Andreotti had wider ranging responsibilities than many full ministers, which caused some envy. Andreotti's main undertaking was representing the interests of Frosinone in the province of Lazio. Lazio would continue to serve as Andreotti's geographical base of power later in his political career. As the state undersecretary in charge of entertainment in 1949, Andreotti established import limits and screen quotas, and provided loans to Italian production firms. The measures were aimed at preventing American productions from dominating the market against Neorealist films, a genre which exhibitors complained lacked stars and was held in low esteem by the public. As he phrased it, there were to be 'Less rags, more legs'. Raunchy comedies and historical dramas with voluptuous toga-clad actresses became the staple of the Italian film industry. To ensure that state funds were not used to prop up commercially unsustainable films, the screenplays were vetted, thereby creating a form of preproduction censorship. It was intended that Italian studios use part of their profits for high-quality films. However, Vittorio De Sica's Umberto D., which depicted the lonely life of a retired man, could only strike government officials as a dangerous throwback, due to the opening scene featuring police breaking up a demonstration of old pensioners and the ending scene featuring Umberto's aborted suicide attempt. In a public letter to De Sica, Andreotti castigated him for his "wretched service to his fatherland." In 1952, ahead of local elections in the municipality of Rome, Andreotti gave proof of his diplomatic skills and gained credibility. In fact Andreotti persuaded De Gasperi not to establish a political alliance with the neo-fascist Italian Social Movement, as Pope Pius XII asked, to prevent a Communist victory. As Secretary, Andreotti contributed to the re-formation of the Italian Olympic Committee, which had been disbanded after the fall of the Fascist regime. In 1953, among other things, he promoted the so-called "Andreotti's veto" against foreign football players in Italian Serie A. After De Gasperi's resignation and retirement in August 1953, Andreotti remained Secretary of the Council under the short-lived premiership of Giuseppe Pella. In 1954, Andreotti became Minister of the Interior in the first government of Amintore Fanfani. From July 1956 to July 1958 he was appointed Finance Minister in the cabinets of Antonio Segni and Adone Zoli. In the same period, Andreotti started to form a corrente (unofficial political association, or a faction) within the Christian Democracy, which was then the largest party in Italy. His corrente was supported by the Roman Catholic right wing. It started its activity with a press campaign accusing Piero Piccioni, son of the deputy national secretary of the DC, Attilio Piccioni, of the murder of fashion model Wilma Montesi at Torvaianica. After the defeat of De Gasperi's old followers in the DC National Council, Andreotti helped another newly formed corrente, the Dorotei, to oust Amintore Fanfani, who was the leader of the left-wing of the party, as Prime Minister of Italy and National Secretary of the DC. On 20 November 1958 Andreotti, then Minister of Treasury, was appointed president of the organizing committee of the 1960 Summer Olympics to be held in Rome. In the early 1960s Andreotti was Minister of Defence, and was widely considered the de facto leader of the right-wing Christian Democratic opposition to Fanfani and Moro's strategy. In this period the revelation that dossiers on virtually every public figure in the country had been compiled by the secret service resulted in the SIFAR affair. Andreotti ordered the destruction of the dossiers; but before the destruction Andreotti provided the documents to Licio Gelli, the Venerable Master of the clandestine lodge Propaganda Due (P2). Andreotti was also involved in the Piano Solo scandal, an envisaged plot for an Italian coup in 1964 requested by then-President of the Italian Republic Antonio Segni. It was prepared by the commander of the Carabinieri, Giovanni de Lorenzo, in the beginning of 1964 in close collaboration with the Italian secret service (SIFAR), CIA secret warfare expert Vernon Walters, William Harvey, then-chief of the CIA station in Rome, and Renzo Rocca, director of the Gladio units within the military secret service SID. In 1968, Andreotti was appointed leader of the parliamentary group of the Christian Democracy, a position he held until 1972. In 1972, with Andreotti's first term as Prime Minister began a period when he was often seen as the éminence grise of governments even when not actually premier. He remained in office in two consecutive centre-right cabinets in 1972 and in 1973. His first cabinet failed in obtaining the confidence vote and he was forced to resign after only 9 days; this government has been the one with the shortest period of fullness of powers in the history of the Italian Republic. Snap elections were called for May 1972 and the Christian Democracy, led by Andreotti's ally Arnaldo Forlani, remained stable with around 38% of the votes, as it happened to the Communist Party which obtained the same 27% of 1968. Andreotti, supported by secretary Forlani, tried to continue his centrist strategy, but his attempt only lasted a year. In fact the cabinet fell for the withdrawal of the external support of the Italian Republican Party on the matter of the local televisions reform. Andeotti's approach owed little to a belief that market mechanisms could be left to work without interference. He used price controls on essential food stuffs and various social reforms to reach an understanding with organised labour. A law of 11 August 1972 extended health insurance to citizens over the age of 65 in receipt of a social pension. A law of 30 June 1973 extended cost of living indexation to the social pension. A devout Catholic, Andreotti was on close terms with six successive pontiffs. He gave the Vatican unsolicited advice on occasion, and was often heeded. He updated the relationship of Roman Catholicism to the Italian state in an accord he presented to parliament. It put the country on a more secular basis: abolishing Roman Catholicism as the state religion, making religious instruction in public schools optional, and having the Church accept Italy's divorce law, in 1971. Andreotti opposed legal divorce and abortion, but despite his party opposition, wasn't able to avoid the legalization of abortion in May 1978. Andreotti was a strong NATO supporter, in fact in 1973 he was invited to America by the U.S. President Richard Nixon. However, in 1972 he paid an official visit to the Soviet Union, which was the first one by an Italian Prime Minister in more than a decade. During his premiership, Italy opened and developed diplomatic and economic relationships with Arab countries of the Mediterranean Basin, and supported business and trade between Italy and the Soviet Union. After his resignation, Andreotti served as Minister of Defence in the government of Mariano Rumor and as Minister of Budget in the cabinets of Aldo Moro. In 1976, the Italian Socialist Party left the centre-left government of Moro. The ensuing elections saw the growth of the Italian Communist Party (PCI), and the DC kept only a minimal advantage as the relative majority party in Italy, which was then suffering from an economic crisis and from terrorism. After the success of his party, the Communist secretary Enrico Berlinguer approached DC's left-leaning leaders, Moro and Fanfani, with a proposal to bring forward the so-called Historic Compromise, a political pact proposed by Moro which would see a government coalition between DC and PCI for the first time. Andreotti, known as a staunch anti-communist, was called in to lead the first experiment in that direction: his new cabinet, formed in July 1976, included only members of his own Christian Democratic party but had the indirect support of the communists. Andreotti's third cabinet was called "the government of the "not-no confidence", because it was externally supported by all the political parties in the Parliament, except for the neo-fascist Italian Social Movement. On 28 January 1977 the Parliament approved the Land Use Law, which introduced severe constraints on construction, such as new criteria for land expropriations and new planning procedures. On 27 July 1978, the Fair Rent Law completed state control of rents with general rules for rent levels and terms of leases. A law of 16 February 1977 introduced ad hoc upgrading of cash benefits for the agricultural sector. In November 1977, pension linkage to the industrial wage was extended to all other pension schemes not administered by INPS. A law of 16 February 1977 extended family allowances to agricultural part-time workers. A law of 5 August 1978 introduced a ten-year housing plan, with the state making funds available to regions for public housing and subsidies for private housing. As premier, Andeotti's urging of fellow leaders in the European Community was influential in the creation of an EU Regional Development Fund, which the south of Italy was to greatly benefit from. In 1977 Andreotti dealt with an economic crisis by criticising the luxury lifestyle of many Italians and pushing through tough austerity measures. This cabinet fell in January 1978. In March, the crisis was overcome by the intervention of Moro, who proposed a new cabinet, again formed only by DC politicians, but this time with positive confidence votes from the other parties, including the PCI. This cabinet was also chaired by Andreotti, and was formed on 16 March 1978. On the morning of 16 March 1978, the day on which the new Andreotti cabinet was supposed to have undergone a confidence vote in the Italian Parliament, the car of Aldo Moro, then-president of the Christian Democracy, was assaulted by a group of Red Brigades (Italian: Brigate Rosse, or BR) terrorists in Via Fani in Rome. Firing automatic weapons, the terrorists killed Moro's bodyguards (two Carabinieri in Moro's car and three policemen in the following car) and kidnapped him. During the kidnapping of Moro, Andreotti refused any negotiation with the terrorists. Moro, during his imprisonment, wrote a statement expressing very harsh judgements against Andreotti. On 9 May 1978 Moro's body was found in the trunk of a Renault 4 in Via Caetani after 55 days of imprisonment, during which Moro was submitted to a political trial by the so-called "people's court" set up by the Brigate Rosse and the Italian government was asked for an exchange of prisoners. After his death, Andreotti continued as Prime Minister of the "National Solidarity" government with the support of the PCI. Laws approved during his tenure included the reform of the Italian National Health Service. However, when the PCI asked to participate more directly in the government, Andreotti refused, and the government was dissolved in June 1979. Due also to conflict with Bettino Craxi, secretary of the Italian Socialist Party (PSI), the other main party in Italy at the time, Andreotti did not hold any further government position until 1983. In 1983, Andreotti became Minister of Foreign Affairs in the first Cabinet of Bettino Craxi, despite the long-lasting personal antagonism between the two men which had occurred earlier on; Craxi was the first Socialist to become Prime Minister of Italy since Unification. On October 7, 1985, four men representing the Palestine Liberation Front (PLF) hijacked the Italian MS Achille Lauro liner off the coast of Egypt, as she was sailing from Alexandria to Ashdod, Israel. The hijacking was organized by Muhammad Zaidan, leader of the PLF. One 69-year-old Jewish American man in a wheelchair, Leon Klinghoffer, was murdered by the hijackers and thrown overboard. The Egyptian airliner carrying the hijackers was intercepted by F-14 Tomcats from the VF-74 "BeDevilers" and the VF-103 "Sluggers" of Carrier Air Wing 17, based on the aircraft carrier USS Saratoga, and directed to land at Naval Air Station Sigonella (a NATO air base in Sicily) under the orders of U.S. Secretary of Defense Caspar Weinberger; there, the hijackers were arrested by the Italian Carabinieri after a disagreement between American and Italian authorities. In fact, the Prime Minister Bettino Craxi claimed Italian territorial rights over the NATO base. Italian Air Force personnel and Carabinieri lined up facing the United States Navy SEALs which had arrived with two C-141s. Other Carabinieri were sent from Catania to reinforce the Italians. The US eventually allowed the hijackers to be taken into Italian custody, after receiving assurances that the hijackers would be tried for murder. The other passengers on the plane (including Zaidan) were allowed to continue on to their destination, despite protests by the United States. Egypt demanded an apology from the U.S. for forcing the airplane off course. The escape of Muhammad Zaidan was done as a result of a deal made with Yassar Arafat. As Minister Andreotti encouraged diplomacy between the United States and the Soviet Union and improving Italian links with Arab countries. In this respect he followed a line similar to that of Craxi, with whom he had an otherwise troubled political relationship. On 14 April 1986, Andreotti revealed to Libyan Foreign Minister Abdel Rahman Shalgham that the United States would bomb Libya the next day in retaliation for the Berlin disco terrorist attack which had been linked to Libya. As a result of the warning from Italy – a supposed ally of the US – Libya was better prepared for the bombing. Nevertheless, on the following day Libya fired two Scuds at the Italian island of Lampedusa in retaliation. However, the missiles passed over the island, landing in the sea, and caused no damage. As Craxi's relationship with the then-National Secretary of the DC, Ciriaco De Mita, was even worse, Andreotti was instrumental in the creation of the so-called "CAF triangle" (from the initials of the surnames of Craxi, Andreotti and another DC leader, Arnaldo Forlani) opposing De Mita's power. On 22 July 1989, Andreotti was sworn in for the third time as Prime Minister. His government was characterized by a turbulent course: Andreotti decided to stay at the head of government, despite the abandonment of many social democratic ministers, after the approval of the norm on TV spots (favorable to private TV channels of Silvio Berlusconi). This choice did not prevent the resurgence of old suspicions and resentments with Bettino Craxi, whose Italian Socialist Party withdrew from their coalition government in 1991. Andreotti would create a new government consisting of Christian Democrats, Socialists, Social Democrats, and Liberals. In 1990 Andreotti revealed the existence of the Operation Gladio; Gladio was the codename for a clandestine North Atlantic Treaty Organisation (NATO) "stay-behind" operation in Italy during the Cold War. Its purpose was to prepare for, and implement, armed resistance in the event of a Warsaw Pact invasion and conquest. Although Gladio specifically refers to the Italian branch of the NATO stay-behind organizations, "Operation Gladio" is used as an informal name for all of them. During his premiership Andreotti clashed many times with President of the Republic Francesco Cossiga. In 1990 Andreotti was involved in getting all parties to agree to a binding timetable for the Maastricht Treaty. The deep Economic and Monetary Union of the European Union favoured by Italy was opposed by Britain's Margaret Thatcher, who wanted a system of competition between currencies. Germany had doubts about committing to the project without requiring economic reforms from Italy, which was seen as having various imbalances. As President of the European Council, Andreotti co-opted Germany by making admittance to the single market automatic once the criteria had been met, and committing to a rigorous overhaul of Italian public finances. Critics later questioned Andreotti's understanding of the obligation, or whether he had ever intended to fulfill it. In 1992, at the end of the legislature, Andreotti resigned from premiership; he was the last Christian Democratic Prime Minister of Italy. The previous year, Cossiga had appointed him Senator for Life. Andreotti was one of the most likely candidates to succeed Cossiga as President of the Republic in the 1992 presidential election. Andreotti and the members of his corrente had adopted a strategy of launching his candidature only after effectively quenching all the others. The strategy was thwarted by allegations against him; moreover, the election was influenced by the murder of the anti-mafia magistrate Giovanni Falcone in Palermo. 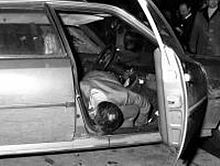 In 1992 an investigation was started in Milan, dubbed Mani pulite. It uncovered endemic corruption practices at the highest levels, causing many spectacular (and sometimes controversial) arrests and resignations. After the dismaying result in the 1992 general election (29.7%) and two years of mounting scandals (which included several Mafia investigations which notably touched Andreotti), the Christian Democracy was disbanded in 1994. In the 1990s most of the politicians prosecuted during those investigations were acquitted, sometimes however on the basis of legal formalities or on the basis of statutory time limit rules. The Christian Democracy suffered heavy defeats in the provincial and municipal elections, and polling suggested heavy losses in the election due in the spring of 1994. In hopes of changing the party's image, the DC's last secretary, Mino Martinazzoli, decided to change the name of the party to the Italian People's Party. Pier Ferdinando Casini, representing the centre-right faction of the party (previously led by Forlani), decided to launch a new party called Christian Democratic Centre and to form an alliance with Silvio Berlusconi's new party, Forza Italia. The left wing faction either joined the Democratic Party of the Left or stayed within the new Italian People's Party, while some right-wingers others joined National Alliance. Andreotti joined the Italian People's Party of Mino Martinazzoli. In 2001 after the creation of The Daisy, a centre-left alliance of parties, Andreotti abandoned the People's Party and joined the European Democracy, a minor Christian democratic political party in Italy, led by Sergio D'Antoni, former leader of the Italian Confederation of Workers' Trade Unions. Andreotti became immediately a prominent member of the party and was widely considered as the de facto leader of the movement. In the 2001 general election the party scored 2.3% on a stand-alone list, winning only two seats in the Senate. In December 2002 it was merged with the Christian Democratic Centre and the United Christian Democrats to form the Union of Christian and Centre Democrats. Andreotti opposed this union and did not join the new party. In 2006, Andreotti stood for the Presidency of the Italian Senate, obtaining 156 votes against the 165 of Franco Marini, former Labour Minister in the last Andreotti Cabinet. On 21 January 2008 he abstained from a vote in the Senate concerning Minister Massimo D'Alema's report on foreign politics. Together with the abstentions of another life senator, Sergio Pininfarina, and of two communist senators, this caused the government to lose the vote. Consequently, Prime Minister Romano Prodi resigned. On previous occasions, Andreotti had always supported Prodi's government with his vote. During the 16th term of the Senate in 2008–13, he opted to join the parliamentary group Union of the Centre – Independents of Pier Ferdinando Casini. Andreotti came under suspicion because his relatively small faction within the Christian Democrats included Sicilian Salvatore Lima. In Sicily, Lima cooperated with a Palermo-based Mafia, which operated below the surface of public life by using control of large numbers of votes to enable mutually beneficial relationships with local politicians. Andreotti said, "But Lima never spoke to me about these things." By the 1980s the old low-profile Mafia was overthrown by the Corleonesi, an extremely violent faction led by fugitive Salvatore Riina. Whereas old Mafia bosses had been cautious about violence, Riina's targeting of anti-mafia officials proved ever more counter-productive. The 1982 murders of parliamentarian Pio La Torre and Carabinieri general Carlo Alberto Dalla Chiesa led to the Maxi Trial. Prosecutors, who could not be disciplined or removed except by their own self-government board, the CSM, were given increased powers. After the January 1992 upholding of the Maxi Trial verdicts as definitive convictions by the supreme court, Riina embarked on a renewed campaign which claimed the lives of the prosecuting magistrates, Giovanni Falcone and Paolo Borsellino, and their police guards. As Riina intended, the assassination of Falcone discredited Andreotti and prevented him becoming the president of Italy. It also led to prosecutors being seen as epitomising civic virtue. In January 1993 Riina was arrested in Palermo. In the aftermath of Riina's capture there were further Mafia bomb outrages that included terror attacks on art galleries and churches, which left ten members of the public dead, and led to weakening of rules on the evidence which prosecutors could use to bring charges. Labeled by Italian media as the "trial of the century", legal action against Andreotti began on 27 March 1993 in the city of Palermo. The prosecution accused the former prime minister of "[making] available to the mafia association named Cosa Nostra for the defense of its interests and attainment of its criminal goals, the influence and power coming from his position as the leader of a political faction". Prosecutors said in return for electoral support of Lima and assassination of Andreotti's enemies, he had agreed to protect the Mafia, which had expected him to fix the Maxi Trial. Andreotti's defense was predicated on character attacks against the prosecution's key witnesses who were themselves involved with the mafia. This created a "his word against theirs" dynamic between a prominent politician and a handful of criminals. The defence said Andreotti had been a long-time politician of national stature, never beholden to Lima; and that far from providing protection, Andreotti had passed many tough anti-mafia laws when in government during the 80's. According to Andreotti's lawyers, the prosecution case was based on conjecture and inference, without any concrete proof of direct involvement by Andreotti. The defence also contended the prosecution relied on the word of mafia turncoats whose evidence had been contradictory. One such informer testified that Riina and Andreotti had met and exchanged a "kiss of honour". It emerged that the informer had received a US$300,000 'bonus' and committed a number of murders while in the witness protection programme. Andreotti dismissed the allegation against him as "lies and slander […] the kiss of Riina, mafia summits […] scenes out of a comic horror film." Andreotti was eventually acquitted on 23 October 1999. However, together with the greater series of corruption cases of Mani pulite, Andreotti's trials marked the purging and renewal of Italy's political system. Andreotti was completely acquitted at first instance, again on appeal to the Court of Appeals, and finally on appeal to the Court of Cassation in 2004, partially due to statute-barred. Therefore the appealed sentence [...] has recognized the participation in the associative crime not in the reductive terms of mere availability, but in the widest and juridically significant ones of a concrete collaboration», that quotes the opinion of the Court of Appeal, is immediately followed by another sentence of the Court of Cassation: «The reconstruction of single episodes and the evaluation of their consequences was made in accordance with comments and interpretations that can also be not shared and against which other ones can be relied on. According to this opinion, the Court of Cassation definitely absolved Giulio Andreotti of all charges. In 2010 the Court of Cassation ruled that Andreotti had slandered a judge who had given testimony, by saying the self-governing body of prosecutors and judges should remove him from his position. Andreotti had said that leaving the man as a judge was "like leaving a lighted fuse in the hand of a child." Contemporaneously with his trial for Mafia association, Andreotti was tried in Perugia with Sicilian Mafia boss Gaetano Badalamenti, Massimo Carminati, and others on charges of complicity in the murder of journalist Mino Pecorelli. The case was circumstantial and based on the word of Mafia turncoat Tommaso Buscetta, who had not originally mentioned the allegation about Andreotti when interviewed by Giovanni Falcone and had recanted it by the time of the trial. Mino Pecorelli was killed in Rome's Prati district with four gunshots, on March 20, 1979. The bullets used to kill him were Gevelot brand, a peculiarly rare type of bullets not easily found on gun markets, legal and clandestine alike. The same kind of bullets were later found in the Banda della Magliana's weapon stock, concealed in the Health Ministry's basement. Investigations targeted Massimo Carminati, member of the far-right organization Nuclei Armati Rivoluzionari (NAR) and of the Banda della Magliana, the head of Propaganda Due, Licio Gelli, Antonio Viezzer, Cristiano Fioravanti and Valerio Fioravanti. On April 6, 1993, Mafia turncoat Tommaso Buscetta told Palermo prosecutors that he had learnt from his boss Gaetano Badalamenti that Pecorelli's murder had been carried out in the interest of Andreotti. 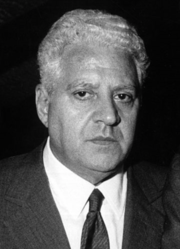 The Salvo cousins, two powerful Sicilian politicians with deep ties to local Mafia families, were also involved in the murder. Buscetta testified that Gaetano Badalamenti told him that the murder had been commissioned by the Salvo cousins as a favor to Andreotti. Andreotti was allegedly afraid that Pecorelli was about to publish information that could have destroyed his political career. 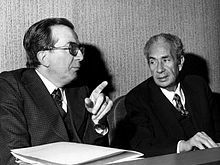 Among the information was the complete memorial of Aldo Moro, which would be published only in 1990 and which Pecorelli had shown to General Carlo Alberto Dalla Chiesa before his death. Dalla Chiesa was also assassinated by Mafia in September 1982. Andreotti was acquitted along with his co-defendants in 1999. Local prosecutors successfully appealed the acquittal and there was a retrial, which in 2002 convicted Andreotti and sentenced him to 24 years imprisonment. Italians of all political allegiances denounced the conviction. Many failed to understand how the court could convict Andreotti of orchestrating the killing, yet acquit his co-accused, who supposedly had carried out his orders by setting up and committing the murder. The Italian supreme court definitively acquitted Andreotti of the murder in 2003. On 16 April 1945, Andreotti married Livia Danese (1 June 1921 – 29 July 2015) and had two sons and two daughters, Lamberto (born 6 July 1950), Marilena, Stefano and Serena. Andreotti said the opinion of others was of little consequence to him, and "In any case, a few years from now, no one will remember me." He died in Rome on 6 May 2013 after suffering from respiratory problems, at the age of 94. The BBC described him as "one of the most prominent political figures of post-war Italy". The New York Times noted he had "a résumé of signal accomplishments and checkered failings that reads like a history of the republic." The Mayor of Rome, Gianni Alemanno, announced the death, stating that Andreotti was "the most representative politician" Italy had known in its recent history. Andreotti was accused of participation in a variety of plots. He was alleged to be the éminence grise behind the Propaganda Due Masonic Lodge, a secret association of politicians, civil servants, industrialists, military leaders, heads of the secret service, and prominent journalists conspiring to prevent the Italian Communist Party taking office. This theory posited control of elements ranging from the neo-fascist Valerio Fioravanti to Rome gangsters the Banda della Magliana and to Operation Gladio, a clandestine NATO organisation that was intended to fight a Soviet conquest of Europe through an armed resistance movement. Andreotti was also accused of having a hand in the death of Aldo Moro and terrorist massacres in a strategy of tension aimed at precipitating a coup, as well as banking scandals and various high-profile assassinations. Fictional characters have been influenced by his image as a Machiavellian. A rejoinder that Andreotti made in reply to an inquiry if being in power was wearing him out—"Power wears out those who don't have it"—was put into the mouth of the character of a powerful Mafia-linked politician in the film The Godfather Part III. 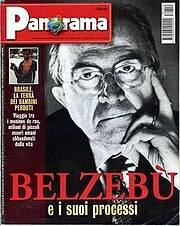 He was nicknamed Belzebù (Beelzebub) or "The Devil himself" by Bettino Craxi, a political opponent who later fled Italy while sought on corruption charges. Other disparaging nicknames included "The Black Pope" and "The Hunchback" (he had a malformed spine). Although relatively tall for an Italian of his generation, cartoonists sometimes portrayed Andreotti as a hunchback dwarf lurking in the background. A joke about Andreotti (originally seen in a strip by Stefano Disegni and Massimo Caviglia) had him receiving a phone call from a fellow party member, who pleaded with him to attend judge Giovanni Falcone's funeral. His friend supposedly begged, "The State must give an answer to the Mafia, and you are one of the top authorities in it!" To which a puzzled Andreotti asked, "Which one do you mean?" In 2008 Andreotti became the subject of Paolo Sorrentino's acclaimed movie Il Divo, which portrayed him as a glib, unsympathetic figure, in whose orbit people tended to meet untimely and unnatural deaths. He reportedly lost his temper when he first saw the movie, but later joked, "I'm happy for the producer. And I'd be even happier if I had a share of the takings." ^ D'Alia, Gianpiero (14 January 2011). "Greetings, Andreotti always set an example for us". UDC official website (in Italian). Archived from the original on 27 January 2012. Retrieved 3 March 2013. ^ Ripa, Rinaldo (2013). Quo vadis, Italy?. Lulu.com. p. 14. ISBN 978-1-304-17955-5. ^ a b c "Giulio ANDREOTTI (XVII Legislatura), Dati anagrafici e incarichi". Senate of the Republic (Italy) (in Italian). Retrieved 6 May 2013. ^ a b c Irving, R. E. M. (July 1976). "Italy's Christian Democrats and European Integration" (PDF). International Affairs (Royal Institute of International Affairs 1944-). 52: 400–416 – via JSTOR. ^ a b c d Mascali, Antonella (6 May 2013). "Andreotti morto, il tribunale disse: 'Ebbe rapporti organici con la mafia'". Il Fatto Quotidiano (in Italian). Retrieved 4 January 2019. The court recognized him guilty of mafia-related crimes until at least 1980, but there were no proofs of his relationship with organized crime after 1980. ^ "Biografia: Giulio Andreotti". De Gasperi.net (in Italian). Archived from the original on 26 December 2004. Retrieved 4 January 2019. ^ a b c d Hooper, John (20 February 2009). 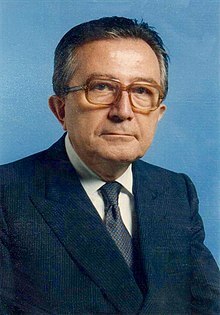 "Prince of Darkness: He was prime minister of Italy seven times - but for many of those years Giulio Andreotti had ties to the Mafia. Now an acclaimed new film sheds light on his enigmatic life". The Guardian. Retrieved 4 January 2019. ^ Cornwell, Rupert (7 May 2013). "Giulio Andreotti: Politician who dominated the Italian scene for more than half century". The Independent. Retrieved 4 January 2019. ^ a b "Giulio Andreotti: Popular PM faced trial with dignity". The Sydney Morning Herald. 8 May 2013. Retrieved 4 January 2019. ^ Crowdus, Gary (Summer 2009). "Exposing the Dark Secrets of Italian Political History: An Interview with Paolo Sorrentino" (PDF). Cinéaste. 34: 32–37 – via JSTOR. ^ a b Stille, Alexander (24 September 1995). "All the prime minister's men". The Independent. Retrieved 4 January 2019. ^ Torresi, Tiziano (2010). L'altra giovinezza. Gli universitari cattolici dal 1935 al 1940 (in Italian). Assisi: Cittadella editrice. ISBN 978-8-83081-032-7. With a preface by Andreotti himself. ^ Orfei, Ruggero (1975). Andreotti (in Italian). Milano: Feltrinelli. ^ Rinaldi, Marcello; Nervo, Giovanni (2006). Dal welfare state alla welfare society: teologia sociale e azione pastorale di Caritas italiana (in Italian). Cantalupa: Effatà Editrice. ISBN 88-7402-301-4. ^ Vespa, Bruno (2007). Storia d'Italia da Mussolini a Berlusconi. Milano: Mondadori. p. 8. ISBN 978-8-80456-382-2. ^ Forlenza, Rosario. "A Party for the Mezzogiorno: The Christian Democratic Party, Agrarian Reform and the Government of Italy" (PDF). Contemporary European History. 19: 331–349 – via JSTOR. ^ Carey, Jane (December 1958). "The Italian Elections of 1958--Unstable Stability in an Unstable World" (PDF). Political Science Quarterly. 73: 566–589 – via JSTOR. ^ Sassoon, Donald (6 May 2013). "Giulio Andreotti obituary". The Guardian. Retrieved 4 January 2019. ^ Bordwell, David; Thompson, Kristin (2010). Film History: An Introduction (3rd ed.). New York: McGraw Hill. p. 333. ISBN 978-0-07338-613-3. ^ "Andreotti salvò lo sport italiano". Dictum (in Italian). 7 May 2013. Retrieved 4 January 2019. ^ "Il governo Pella". Della Repubblica.it (in Italian). Retrieved 4 January 2019. ^ Messina, Dino (2 July 2009). "Caso Montesi, la talpa di Fanfani". Corriere della Sera (in Italian). Retrieved 17 October 2010. ^ Proietti, Fernando (12 November 1993). "Morto Franco Evangelisti il camerlengo di Andreotti". Corriere della Sera (in Italian). p. 15. ^ "Lo sport italiano ricorda Giulio Andreotti". Comitato Olimpico Nazionale Italiano. 2013. Retrieved 4 January 2019. ^ Senato Della Repubblica-Camera Dei Deputati, Xii Legislatura, Doc. XXXIV, N. 1, Relazione Del Comitato Parlamentare Per I Servizi Di Informazione E Sicurezza E Per Il Segreto Di Stato, § 4.2 (Report) (in Italian). Appare credibile quanto affermato a suo tempo dall'ingegnere Francesco Siniscalchi e dai dottori Ermenegildo Benedetti e Giovanni Bricchi circa una possibile donazione di fascicoli che l'ex capo del SIFAR Giovanni Allavena avrebbe effettuato a Gelli al momento di aderire alla loggia P2 nel 1967. Negli anni successivi, inoltre, l'adesione alla loggia di pressoché tutti i principali dirigenti del SID rende più che plausibile un travaso informativo da questi ultimi a Gelli. ^ De Lutiis, Giuseppe (1985). Storia dei servizi segreti in Italia (in Italian). Rome: Editori riuniti. ISBN 978-8-83592-690-0. ^ Ruta, Carlo (1994). Il processo: Il tarlo della Repubblica (in Italian). Perugia: Eranuova edizioni. ISBN 978-8-88541-205-7. ^ "La vita di Giulio Andreotti: presidente del Consiglio per 7 volte". Huffington Post Italia (in Italian). 6 May 2013. Retrieved 4 January 2019. ^ Nohlen, Dieter; Stöver, Philip (2010). Elections in Europe: A data handbook. Baden-Baden: Nomos. p. 1048. ISBN 978-3-8329-5609-7. ^ Giurato, Luca (26 June 1972). "Andreotti presenta a Leone il nuovo governo di centro". La Stampa (in Italian). p. 1. ^ Moretti, Samuel (9 March 2011). "Eravamo quattro amici a Telebiella". La Stampa (in Italian). ^ a b c d "Giulio Andreotti". The Daily Telegraph. 6 May 2013. Retrieved 4 January 2019. ^ Tonelli, Matteo (6 May 2013). "Ex-Italian PM Giulio Andreotti dies. Prominent political figure of post-war Italy". la Repubblica. Retrieved 4 January 2019. ^ "Giulio Andreotti". The Economist. 11 May 2013. Retrieved 4 January 2019. ^ "La visita di Giulio Andreotti a Mosca". Archivi Aamod (in Italian). 24 October 1972. Retrieved 4 January 2019. ^ "Biografia di Giulio Andreotti". Biografieonline.it (in Italian). Retrieved 4 January 2019. ^ Fallaci, Oriana (1974). Intervista con la storia (in Italian). Milan: Rizzoli. ^ "Il governo della "non sfiducia", nel 1976". Il Post (in Italian). 10 April 2013. Retrieved 4 January 2019. ^ Flora, Peter, ed. (1986). Growth to Limits: The Western European Welfare States Since World War II (Volume 4). Berlin: de Gruyter. ISBN 978-0-89925-266-7. ^ Moro, Aldo (1978). "Il Memoriale di Aldo Moro" (PDF). ValerioLucarelli.it (in Italian). Retrieved 17 October 2010. ^ "The 1985 Achille Lauro affair". F-14 Tomcat in Combat. Retrieved 21 March 2013. ^ Heymann, Philip B. (2000). Terrorism and America: A Commonsense Strategy for a Democratic Society. Cambridge, Massachusetts: The MIT Press. ISBN 978-0-26208-272-3. ^ Snyder, William P.; Brown, James (2004). Defense Policy in the Reagan Administration. DIANE Publishing. p. 141. ISBN 0-7881-4146-5. ^ Bosiljevac, T.L. (1990). SEALS: UDT/SEAL Operations in Vietnam. Ballantine Books. p. 200. ISBN 0-8041-0722-X. ^ Tobias, Binyamin; Bettini, Daniel (2 April 2018). "Italian magazine publishes Arafat's secret journals". Ynetnews. Retrieved 4 January 2019. ^ Andreotti, Giulio. "Foreign policy in the Italian democracy". Political Science Quarterly. 109 (Special Issue 1994): 529. doi:10.2307/2152618. ^ David, Ariel (30 October 2008). "Reports: Italy warned Libya of 1986 US strike, EU". The Guardian. Archived from the original on 21 March 2009. Retrieved 31 December 2018. ^ a b Consonni, M. M. (1993). "Italy" (PDF). The American Jewish Year Book. 93: 271–281 – via JSTOR. ^ Haberman, Clyde (16 November 1990). "Evolution in Europe; Italy Discloses its Web of Cold War Guerrillas". The New York Times. Retrieved 20 February 2015. ^ Ferrera, Maurizio; Gualmini, Elisabetta (2004). Rescued by Europe? : Social and Labour Market Reforms in Italy. Amsterdam: Amsterdam University Press. pp. 132–133. ISBN 978-9-05356-651-0. ^ Cotta, Maurizio; Verzichelli, Luca (2007). Political Institutions of Italy. Oxford University Press. p. 38. ISBN 978-0-19-928470-2. Retrieved 24 August 2012. ^ Bellucci, Paolo (2002). The Return of Berlusconi. Berghahn Books. p. 296. ISBN 978-1-57181-611-5. ^ Gilbert, Mark F.; Nilsson, Robert K. (2010). The A to Z of Modern Italy. Rowman & Littlefield. p. 436. ISBN 978-0-8108-7210-3. ^ a b Follain, (2012). ^ a b Mirabella, Julia Grace (5 January 2012). "Scales of Justice: Assessing Italian Criminal Procedure Through the Amanda Knox Trial". Boston University International Law Journal. 30 (1). footnote 151. ^ Cowell, Alan (16 January 1993). "Italy Arrests Sicilian Mafia's Top Leader". The New York Times. Retrieved 4 January 2019. ^ a b c Briquet, Jean-Louis (1999). "The Faltering Transition" (PDF). Italian Politics. 15: 123–138 – via JSTOR. ^ a b c d Allum, Percy (1997). "Statesman or Godfather? The Andreotti Trials" (PDF). Italian Politics. 12: 219–232 – via JSTOR. ^ Gilbert, Mark; Pasquino, Gianfranco, eds. (2000). Italian Politics: The Faltering Transition. Boulder, Colorado: Westview Press. p. 130. ISBN 978-1-57181-840-9. ^ Cowell, Alan (22 May 1994). "Italy Inquiry Asks Andreotti's Trial on Mafia Ties". The New York Times. Retrieved 4 January 2019. ^ a b Cowell, Alan (21 April 1993). "Andreotti and Mafia - A Kiss Related". The New York Times. Retrieved 4 January 2019. ^ "Esposizione Introduttiva Del Pubblico Ministero nel processo penale n. 3538/94 N.R., instaurato nei confronti di Giulio Andreotti". Gutenberg.us (in Italian). Archived from the original on 28 February 2013. Retrieved 19 February 2014. ^ "Delitti 'politici' di mafia". Almanacco dei misteri d' Italia. April 2002. Archived from the original on 21 October 2007. ^ a b c "Suprema Corte di Cassazione, Sezione Seconda Penale, sentenza n.49691/2004 (Presidente: G.M. Cosentino; Relatore: M. Massera) Depositata in Cancelleria il 28 dicembre 2004" (PDF). Leggi Oggi (in Italian). Retrieved 4 January 2019. ^ "Andreotti, il caso è chiuso Cassazione: assoluzione giusta". la Repubblica (in Italian). 15 October 2004. Retrieved 4 January 2019. ^ "Andreotti convicted of slandering judge". La Gazzetta del Mezzogiorno. 4 May 2010. Retrieved 4 January 2019. ^ Clough, Patricia (16 April 1993). "The Andreotti Affair: Supergrasses target Andreotti". The Independent. Retrieved 4 January 2019. ^ Bohlen, Celestine (12 April 1996). "Andreotti Is Back in Court, This Time on Murder Charge". The New York Times. Retrieved 4 January 2019. ^ Calabrò, Maria Antonietta (15 April 1993). "Intreccio Pecorelli-Moro: già da un anno s'indaga". Corriere della Sera (in Italian). Archived from the original on 12 May 2011. Retrieved 19 October 2010. ^ Stanley, Alessandra (25 September 1999). "Ex-Premier Andreotti Acquitted of Mafia Murder Conspiracy". The New York Times. Retrieved 4 January 2019. ^ "Court Clears Andreotti of Murder Charge". The New York Times. 31 October 2003. Retrieved 4 January 2019. ^ Bruni, Frank (19 November 2002). "Andreotti's Sentence Draws Protests About 'Justice Gone Mad'". The New York Times. Retrieved 4 January 2019. ^ "Andreotti fights back on Mafia allegations". The Age. 30 November 2002. Retrieved 4 January 2019. ^ "Giulio Andreotti". The Daily Telegraph. 6 May 2013. Retrieved 31 August 2013. ^ Rizzo, Manuela (31 July 2015). "Morta Livia Danese la vedova di Giulio Andreotti funerali il 31 luglio a Roma". NewsItaliane.it (in Italian). Archived from the original on 1 August 2015. Retrieved 4 January 2019. ^ a b "Giulio Andreotti: Ex-Italian prime minister dies". BBC News. 6 May 2013. Retrieved 6 May 2013. ^ Tagliabue, John (6 May 2013). "Giulio Andreotti, Premier of Italy 7 Times, Dies at 94". The New York Times. Retrieved 6 May 2013. ^ "Giulio Andreotti, former Italian prime minister, dies aged 94". The Guardian. 6 May 2013. Retrieved 6 May 2013. ^ Gancer, Daniele (2005). Nato's Secret Armies: Operation Gladio and Terrorism in Western Europe. London, UK: Frank Cass. p. 24. ISBN 978-0-71468-500-7. ^ Monzat, René (1992). Enquêtes sur la droite extrême (in French). Paris: Le Monde-éditions. p. 89. ISBN 978-2-87899-040-9. ^ Willan, Philip (1991). Puppetmasters: The Political Use of Terrorism in Italy. London: Constable. p. 301. ISBN 978-0-09470-590-6. ^ Leney, Fiona (10 October 1993). "The terror trail that won't grow cold: Dark forces bombed Bologna station in 1980, killing 85. At a retrial tomorrow, the victims' relatives may see justice done". The Independent. Retrieved 4 January 2019. ^ Bondanella, Peter (2004). Hollywood Italians: Dagos, Palookas, Romeos, Wise Guys, and Sopranos. New York: Continuum. p. 269. ISBN 978-0-82641-544-8. ^ Ide, Wendy (19 March 2009). "Il Divo: the Spectacular Life of Giulio Andreotti". The Times. Archived from the original on 9 May 2009. Wilsford, David, ed. Political leaders of contemporary Western Europe: a biographical dictionary (Greenwood, 1995) pp 8–16. This page is based on the Wikipedia article Giulio Andreotti; it is used under the Creative Commons Attribution-ShareAlike 3.0 Unported License (CC-BY-SA). You may redistribute it, verbatim or modified, providing that you comply with the terms of the CC-BY-SA.